PARK LIMITED MUZIK has often prided itself on discovering fresh and exciting talent. DJ NORY is a young and refreshing face in a slew of the same. Despite ‘Get It On’ being his debut, DJ NORY has al-ready garnered attention from top DJs due to his FUNDAMENTAL club night at WOMB in Japan. The Original Mix is a dark progressive track that’s given an extra twist with some vocal samples. The remix is provided by Icelandic DJ/producer OCULUS. His remix starts out in a rather deep atmosphere; while the synth melodies interact well with the groovy bass. Due for release on 14th April 2009 on PARK LIMITED MUZIK. PARK LIMITED MUZIK has often prided itself on discovering fresh and exciting talent. DJ NORY is a young and refreshing face in a slew of the same. 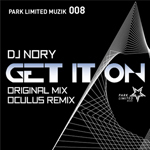 Despite ‘Get It On’ being his debut, DJ NORY has al-ready garnered attention from top DJs due to his FUNDAMENTAL club night at WOMB in Japan. The Original Mix is a dark progressive track that’s given an extra twist with some vocal samples. The remix is provided by Icelandic DJ/producer OCULUS; who got into DJing when he was around 14 years old. Shortly thereafter, he was soon playing at some of Iceland’s better-known clubs. Since then he has been evolving his music and performances as a DJ or a live act. Oculus’ music has been spreading fast throughout the globe and is being released on labels based in USA, Ireland, Germany, Canada, Poland and so on. His music style spans everything from deep and atmospheric minimal to electro and bass driven techno. His remix starts out in a rather deep atmosphere; while the synth melodies interact well with the groovy bass.